Released in the US in 1990, Italy's Cinema Paradiso was a movie that truly celebrated the love of movies. It was especially significant to me as I had seen it right before I began working at a movie theater and soon became a projectionist which I still regard as the most satisfying job I've ever had. The story begins in present-day Rome (circa 1988, when the movie was shot) when successful filmmaker Salvatore (Jacques Perrin) returns home late one night and is told by his female companion that she just received a phone call from his mother, whom he hasn't visited in about 30 years. She had called to let him know that someone named Alfredo had recently died and his funeral is the next day. Salvatore then gets into bed and begins processing this news, prompting a lengthy humorous and sentimental flashback that makes up the bulk of the movie. We then see a young Salvatore (Salvatore Cascio) serving as an altar boy in a small Italian village during the post-war 1940s. The priest, Father Adelfio (Leopoldo Trieste), lightly scolds him for slacking off a bit, then sends him home as he has "something to do". Salvatore then follows him from a distance as the priest enters the town's only movie theater, the Cinema Paradiso, which is run by the parish to entertain the population there. He shouts up to the projectionist Alfredo (Philippe Noiret) to run the latest movie for him so that he can properly censor it to the parish's standards. 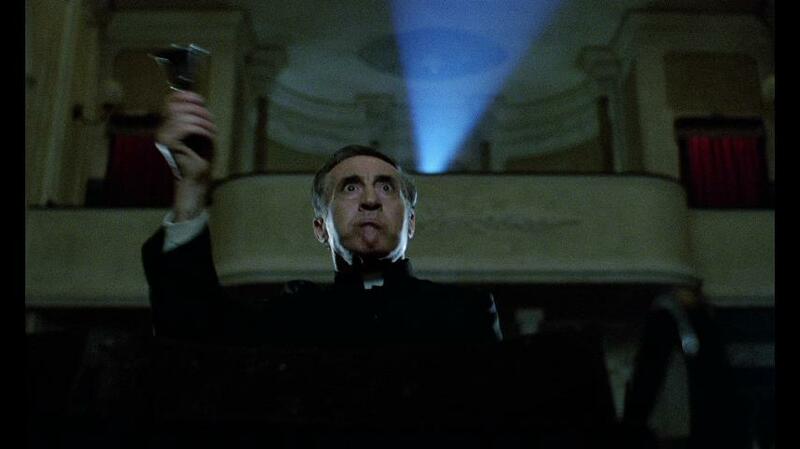 As a couple onscreen begins to kiss, Father Adelfio sternly rings a bell high in the air signaling Alfredo to cut that moment out before the movie is shown to the public. Salvatore watches all of this from the sidelines and laughs, then sneaks upstairs to the projection booth and pesters Alfredo to show him all that he does. Alfredo is first quite annoyed (and this was something I kept in mind as I cautiously went up to the projection booth for the first few times at the theater I was hired at, which was one of the few theaters that still employed union projectionists) but soon warms up to Salvatore and eventually shows him how to run the projector. Alfredo also becomes a father figure to Salvatore, whose real father went missing in the military. Alfredo states the thing he loves the most about his job, which was something I loved a lot about running film as well: when you hear a theater full of people laughing, you know that you've brought some joy into their lives. I've also gotten a thrill just out of knowing I was the one to put that picture and sound up there, and Salvatore seems to feel the same way as he gazes at the screen from the booth as he runs his first showing. The two of them spend a bit of time together in the projection booth, but during one showing the film catches fire (safety film having not yet been invented) and not only causes severe damage to the theater but also leaves Alfredo blinded. The church cannot afford to repair the extensive damage to the theater, but a local citizen who recently became rich in a bet steps in and re-opens it as the "Nuovo Cinema Paradiso" with a revamped interior and to the delight of the townsfolk the films are no longer censored- the first time an onscreen kiss happens the patrons applaud loudly. Since Alfredo was blinded in the fire, Salvatore is entrusted with running the films this time, and he does so for many years until Marco Leonardi steps in to play him as a young man. By this time Salvatore has also taken up shooting his own films around town as a hobby, and soon becomes enchanted by Elena (Agnese Nano) when she is caught on film. He soon proclaims his love for her but she isn't easily won over- he then puts serious effort into winning her heart and ultimately faces some hard decisions about whether to stay in his familiar surroundings or break free into the world beyond and achieve bigger and better things- which coincidentally became a similar dilemma I had to face myself after I had been in the theater business for ten years and the long-term prospects of that began to diminish. It's simply difficult not to love this film if you're already a fan of movies and have at least attended a few showings at theaters that are actually special rather than cold, heartless corporate multiplexes that now make up most of the moviegoing options. When I had first seen it on VHS I was immediately captivated and only more so desired to work at the local theater, which was a dream that became true soon afterwards. The Miramax US release won that year's Academy Award and Golden Globe for Best Foreign Language Film, but there was a bit of a history to the movie before that happened. It was first released in Italy in 1988 and did not make much of an impact, with the main criticism being that it was too long at nearly three hours. Director Giuseppe Tornatore, faced with the chance that meddling studio executives might shorten the movie as they saw fit, decided to put together a shorter version himself. For the movie's 20th anniversary, the longer cut was released to theaters as "The New Version" and this Arrow release presents both versions allowing one to decide for themselves which one they prefer. Seeing the longer cut for the first time here, there were a number of interesting moments added including a rather odd scene where a "teleprojector" is installed at the cinema and the audience watches a TV game show (of course in the 1950s, the advent of television caused a decline in movie theater attendance). Most notable to this version though is an extended ending where Salvatore tracks down Elena after not seeing her for several decades and we learn the reason why they didn't end up happily ever after. 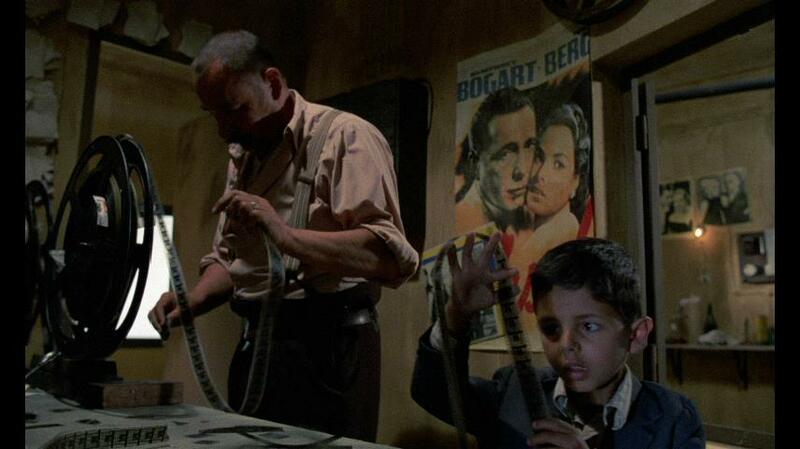 Somehow I had not revisited Cinema Paradiso since my first VHS viewing until now (mainly because I felt that the yellow electronic subtitles on that release ruined the atmosphere of the movie, a common complaint I've had with foreign films on video). While it was certainly a joy to see it again, I did notice right away that the featured cinema was using only ONE projector and I then had to do a bit of research to determine whether this was a mistake by the filmmakers or not. Typically during that era, theaters were equipped with TWO projectors, each running a 20-minute reel and then "changing over" to the next reel on the other machine with no perceived transition by the audience as long as the projectionist was doing it right. Since the 1970s movies ran on flat "platters" that held up to four hours of film which then allowed an entire movie to run continuously on one projector and largely unattended. While this isn't addressed in any of the extras included on this release, it seems that in Italy many cinemas did in fact have only one projector and usually half of a feature was shown with an intermission in between. Both versions of the movie are presented in the 1.66 aspect ratio, a typical format for European films though most American theaters showed these with the top and bottom cropped. Picture quality on both is very clean, with film grain where it should be. The English subtitles are player-generated in the usual white font and can be turned on or off; I've seen this movie so many times I hardly need the subtitles anymore. When I first saw Cinema Paradiso via HBO's VHS release, I found the electronic yellow subtitles annoying, at least the subtitles here are a bit more film-like and can be turned off. The original US release was in mono (by this time only the very small films were produced with mono audio; I can count the number of movies I projected with mono sound on one hand) and the Blu-Ray includes that mix in 1-channel PCM. There's also a remixed 5.1 track in DTS Master Audio but it really doesn't do much, the sound just seems to be spread across the three front channels with no directionality. The extended version was released in theaters with a digital 5.1 mix, and that disc includes that in DTS Master Audio as well as 2-channel PCM. The sound fares a lot better here, primarily with the music score. In addition to containing two different versions of the movie on separate discs, this release from Arrow also includes an hourlong piece called "A Dream of Sicily" which focuses on director Giuseppe Tornatore's career as a whole, touching only a little bit on Cinema Paradiso. "A Bear and a Mouse in Paradise" focuses more closely on the movie, produced near the 20th anniversary with insights from all three actors who played Salvatore as well as Philippe Noiret, as well as a brief explanation of the unsuccessful original release and subsequent cuts that led to its award-winning status. "The Kissing Sequence" dissects the scene that serves as the ending in both versions of the movie, and to say any more about it here would spoil it for those who have not yet seen it- though I will say it's very memorable. Finally there's trailers for both the "New Version" and a 25th anniversary re-release of the general cut. The theatrical version also includes a commentary track that was present on the Collector's Edition DVD released by The Weinstein Company a few years ago. This track mainly features Yale University professor Millicent Marcus with a few clips of director Torantore (speaking English) interspersed. While an interesting listen, Marcus spends much of the time simply narrating what's happening onscreen- although a few cultural and regional aspects are clarified that might not be so obvious to American audiences. Arrow includes a nice booklet with color stills, behind-the-scenes photos and movie posters along with an essay by Pasquale Iannone. 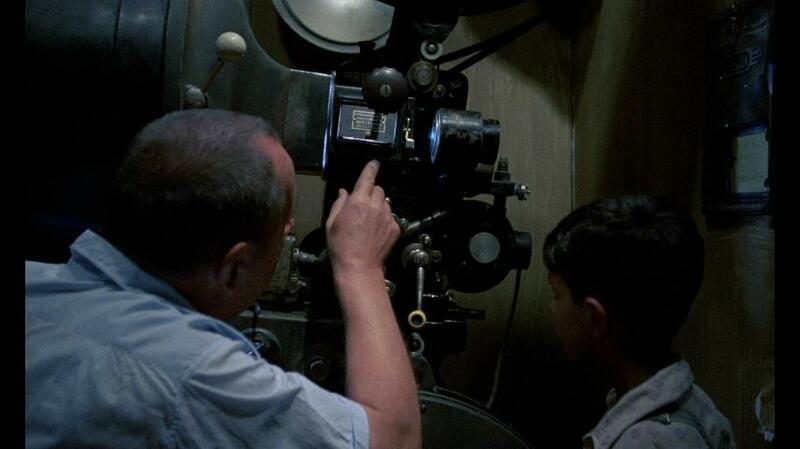 Cinema Paradiso is one of those movies that every film lover should see at least one time- many will fall in love with it while more cynical viewers might just see this as preaching to the choir, but only a real Grinch would dislike it entirely. Arrow's Blu-Ray release presents both versions of the movie for audiences to compare and decide for themselves which one is definitive.